"We send herewith items for inclusion in the agenda for the National Anomaly Committee meeting. There may be a few items, apart from these, as finalized items have only been circulated a few days amongst our constituents. We shall submit the same as soon as it is received" Shiva Gopal Mishra, Secretary, National Council (Staff Side) Joint Consultative Machinery. 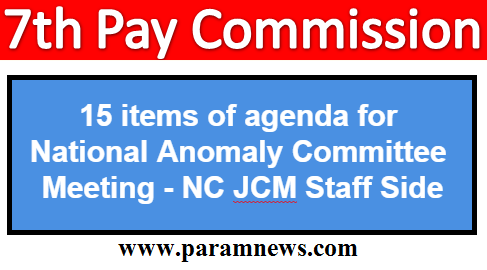 Shiva Gopal Mishra, Secretary, National Council (Staff Side) Central Government Employees has submitted fifteen important items for inclusion in the agenda for the NAC meeting based on 7th CPC Anomaly on August 16, 2017 to Dy. Secretary - JCA, DoPT.